During #24DaysofGiving this December, we’re highlighting all the good your health data is doing within – and well beyond – the PatientsLikeMe website. Here’s another great example. 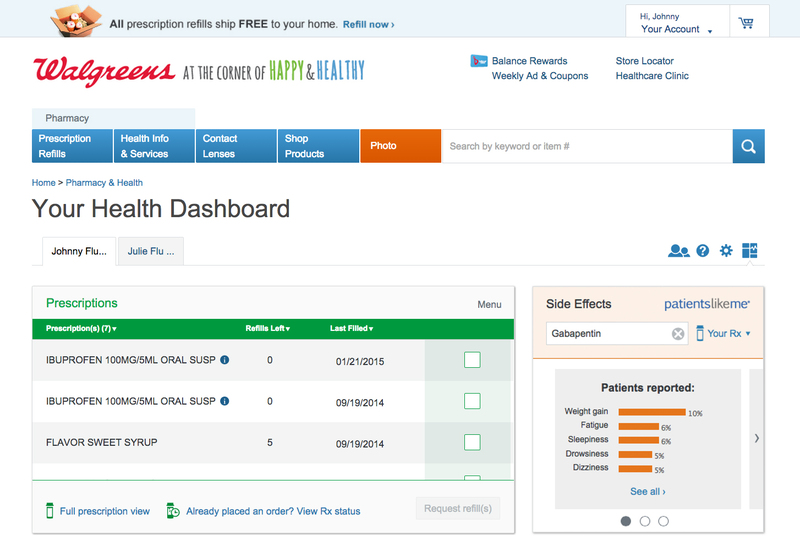 Did you know the side effect data you report on your PatientsLikeMe treatment evaluations is helping pharmacy customers understand how the medications they take may affect them, too? It started back in February this year when we kicked off a new collaboration with Walgreens, the nation’s largest drugstore chain. The idea was simple; by joining forces, we could help bring your experiences to many more people making treatment decisions. Now anyone researching a medication or filling a prescription on Walgreens.com can see a snapshot of how PatientsLikeMe members have been impacted by that medication, including side effects and their severity. There are currently about 6,000 medications at Walgreens pharmacies where others can learn from your experiences, and the data (de-identified!) is updated daily based on what you report on PatientsLikeMe. This partnership marks the first time a company has displayed your real-world data on their website. Why did they do it? Because your data and experiences can help patients, wherever they are, understand more about the treatments they’re taking, and make more informed health decisions. Our partners understand and recognize that. Here’s another reason (one you can probably relate to). To find side effect information for a treatment, you normally have to scour the Internet or read that sheet of paper that gets stapled to your prescription bag. (Does anyone really read that?) But information like that only represents a tiny fraction of the population, usually just a few hundred or at most a few thousand who took part in the clinical trial for the treatment. The thing is, you might be taking the treatment off-label. In fact, more than one in five outpatient prescriptions written in the U.S. are for off-label uses, and 75 percent of these uses have little or no scientific support. This means the treatment may affect people a little bit differently. So having real-world experiences like yours gives a broader picture for people trying, or deciding to try, that treatment. The next time you record a treatment evaluation, know that you’re doing much more than you think. By sharing information about side effects, you’re making it easier for someone else to make a better decision for them. We’re truly better, together. Share this post on Twitter and help spread #dataforgood during #24DaysofGiving. Radley DC, Finkelstein SN, Stafford RS. Off-label prescribing among office-based physicians. Arch Intern Med. 2006;166(9):1021-1026. doi: 10.1001/archinte.166.9.1021. CAMBRIDGE, MA., December 8, 2015—PatientsLikeMe has been awarded a $900,000 grant from the Robert Wood Johnson Foundation (RWJF) to help jumpstart changes that will amplify the patient voice in the measurement of healthcare performance. A portion of the grant funds a collaboration between PatientsLikeMe and the National Quality Forum (NQF) to develop, test and facilitate the broader use of patient-reported outcome measures (PROMs) to assess patient-reported health status. While PROMs have been used in clinical research, they are rarely used in routine clinical care to assess provider performance. In such settings, performance is primarily assessed by what was done to the patient (using process measures) and what happened to the patient (using clinical outcome measures), but not always by what may be most important to the patient. NQF is a not-for-profit, nonpartisan, multi-stakeholder, membership-based organization that works to help advance improvements in healthcare. It evaluates, endorses, and selects measures of quality, safety and cost for accountability. The collaboration with PatientsLikeMe is one of several that are part of NQF’s new Measure Incubator, an innovative effort that holds the potential to facilitate measure development and testing more efficiently through collaboration and partnership. NQF’s Chief Scientific Officer, Helen Burstin, MD, MPH, sees the collaboration with PatientsLikeMe as the answer to an urgent need for new measures that can improve health and healthcare outcomes. Creating measures that matter to patients became easier in 2013 when RWJF gave PatientsLikeMe a grant to create the Open Research Exchange (ORE), an open-participation platform that allows researchers to connect with PatientsLikeMe’s 380,000 members to create, test and validate new measures. The collaboration with NQF will initially use the ORE platform to ask patients to prioritize measures, then PatientsLikeMe will develop and test them. This process will ensure that when implemented in clinical care settings, the measures broadly show a patient population’s progress and reflect health outcomes that are important to patients that can then be used to assess an organization’s performance and ultimately to determine reimbursement. Patient-reported outcomes (PROs) are defined as any report of the status of a patient’s (or person’s) health condition, health behavior, or experience with healthcare that comes directly from the patient, without interpretation of the patient’s response by a clinician or anyone else. Various tools such as questionnaires, scales, or single-item measures that enable researchers, administrators, clinicians and others to assess patient-reported health status for physical, mental, and social well-being are referred to as PRO measures (PROMs). PROMs have been commonly used in clinical research because they are based on patient input, and can help ensure that the treatments developed actually help people feel better and improve symptoms or function. Their application in the clinical care setting is limited, but growing interest among various stakeholders is moving PROMs into more routine use for performance measurement. An example of this is the widely used Patient Health Questionnaire 9 (PHQ-9) that screens and monitors the severity of depression. In a clinical setting, PROMs can help monitor patient progress over time at the individual and population level and support shared decision making. A PRO performance measure (PRO-PM) is based on aggregated patient-reported data and is used to assess quality of care for accountable entities, such as hospitals, physician practices or accountable care organizations (ACOs). NQF endorses PRO-PMs for purposes of performance improvement and accountability.